If one were to look at a wildebeest by itself, one might not be completely impressed. They are less graceful cousins to the antelope, and kind of ugly. Maybe the best thing that can be said about the wildebeest is that it places a high value on family. So high, in fact, that the annual movement of one group of wildebeests in the Masai Mara has become one of the world’s most sought after natural spectacles. This spectacle is known as the Great Wildebeest Migration, capital G, W, M.
Thousands of travelers every year come to eastern Africa simply because they want to see the Great Migration, and use companies like Global Basecamps to ensure they get the best views of its river crossings, courting, birthing and all the rest of the drama. Our Travel Specialists know exactly which safari camps can fit both your budget, and your wildlife viewing priorities. Even better, some semi-permanent camps migrate along with the wildebeests, maintaining their prime location for game viewing. 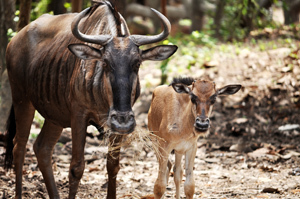 January - March: Wildebeests are all mainly born during these months. In fact, nearly 300,000 calves are all born within a three week period. You will find them happily grazing in the most southern point of their migration, near the Ngorongoro Crater Highlands in Tanzania. More young wildebeests means more predator action. All these factors combine into this season being the most popular in Northern Tanzania, so be prepared to pay high season rates. April - August: These months are just as dramatic in their own way. The rains, and vegetation, begin to move north. Moving in a clockwise fashion and starting at the six o’clock position, the Migration moves northwest into the central and western Serengeti. The action continues through these months, culminating in July, when 2 million wildebeests all cross the same crocodile infested rivers. They make their crossing into Kenya’s Masai Mara around August. September - December: The Migration settles in southern Kenya’s Masai Mara after its long ordeal. The swarm of movement breaks up into smaller herds, as the wildebeests struggle to find water and food. This area is pretty much exhausted of resources by November, and as the short rains begin to the south, the Wildebeests complete their circle from the 12 o’clock position, back down into the Serengeti, to begin the process over again by the end of December. Can’t get enough Africa? Trying to decide exactly which safari destination fits your priorities? 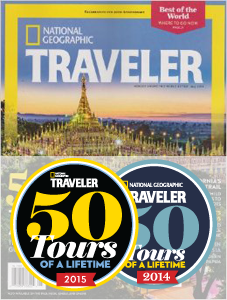 Download our free travel guide to help narrow down your choices!